When you are assessing student work, whether it’s writing, group presentations, speeches or any other aspect of their school performance, there’s a good chance that you have some comments which apply to multiple students. Use this tool to save you hours. 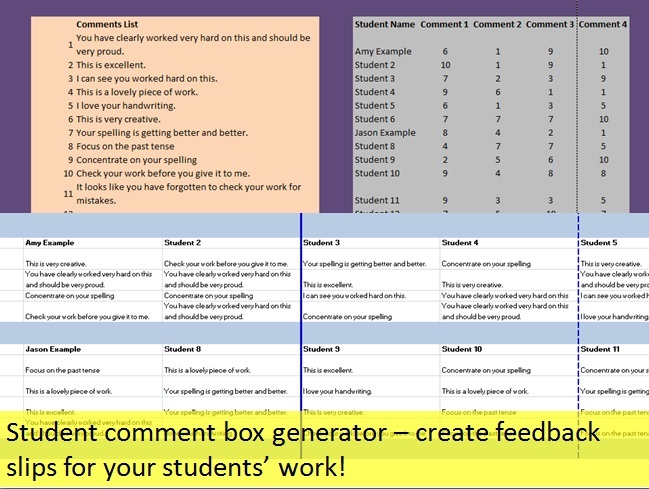 Simply add in the most common comments that you make (eg ‘ You worked very hard on this speech, but it was very difficult to hear you.’), add the names of the students and assign which comments you want to appear in the feedback for which students. This tool works up to a maximum of 30 students and now up to 100 of your comments. If you need more student names or more comments, simply save a second version of the tool.